I had considered making fresh, homemade pasta for awhile. 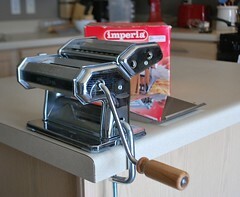 Last summer, I received my brother's mother-in-law's cousin's pasta machine. 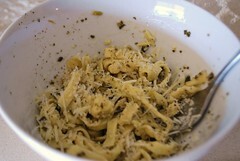 This year, my favorite blog featured a tutorial on making pasta. With the long weekend, I was set to give it a try. I didn't get any action shots of us using the machine since it required the attention of two people. Our first pass didn't go so well since the dough needed more kneading but eventually we got it. I intended to toss the fresh pasta with the best pesto I've ever had ohmygod, but it was sold out at the Farmer's Market for the first time ever. 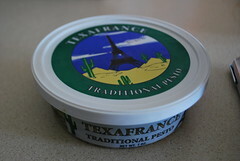 This Texafrance stuff seemed intriguing enough and tasted pretty good. And then the pasta, mmm, quite good. Austin thought it was a little too doughy and I think we could tweak it but I was pleased with my first attempt at making fresh pasta.